Summary of today’s show: Proponents of a ballot initiative to legalize physician assisted suicide in Massachusetts cloak their effort in misleading terms like “compassion” and “choice”. Scot Landry and Fr. Chris O’Connor expose the lies of the assisted suicide movement, which has been defeated in 124 of 127 places it’s been advanced, and give a thorough discussion of the Church’s teaching on assisted suicide by examining the US bishops’ recent letter “To Live Each Day with Dignity”. 1st segment: Scot and Fr. Chris caught up on the past week and talked about how Fr. Chris and Fr. Wayne Belschner celebrated their 40th birthdays. The Italian families at their parish in East Boston invited them for an incredible Italian feast. 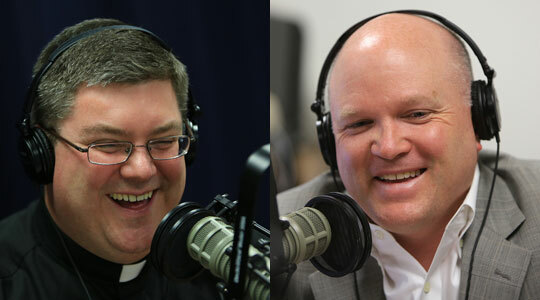 They discussed the ending of the Seminary year, including preparing the 4th year seminarians for ordination. Fr. Chris said they also had Archbishop Henry Mansell of Hartford celebrate Mass at the seminary this past weekend for the candidacy of the men preparing for the priesthood at the end of their first year of theology, which would normally give them three more years to ordination. Fr. Chris said one of the men put it as “You’re now officially engaged” to the Church. He said this is the first step to ordination. Next year they would be made acolytes, which would allow them to serve in an official capacity at the altar. The third year, they would also be made lector, giving them an official capacity to proclaim God’s word. They then discussed how these ceremonies and titles are different from those who serve in parishes. Scot switched to today’s topic and said he’s been surprised by how many people in Massachusetts he meets who have no idea that this fall we could be voting on whether to legalize assisted suicide. They will be going through an important document on the topic today in depth. Scot said it begins by comparing the hope we have was Christians with the fear of the end of life. Fr. Chris said there is fear of passing from this world to the next. God is with us at the beginning and the end of life and in a continuum from one to the next. Scot said we hope in our final days we will be surrounded by loved ones, that it will be without pain, we will not be a burden on others. We have fears that we will linger in pain or dementia or be a burden. We can respond to those hopes and fears in others with love or by telling them to end their lives abruptly. Fr. Chris said the gift of life is a gift that we’re not in charge, but it belongs to the Lord for us to cherish and value. He said on becoming a burden to others, we have to think of it as a moment to allow ourselves to be loved by and care for by others. Family members are naturally desirous to surround us and care for us. The bishops are reminding us we live in a culture that is concerned with the expedient. He said Archbishop Mansell talked about the reality that if you want to destroy a person, convince them that they’re useless. Scot said there’s nothing in Catholic teaching that says you can’t get the maximum pain relief for any physical pain, but those who choose suicide aren’t about physical pain, but mental and spiritual anguish. That’s what people at the end of life really need. Today there is a campaign to respond to these fears and needs in a radically different way. It uses terms like “death with dignity” to describe a self-inflicted death, generally using a drug overdose prescribed by a doctor for the purpose of suicide. This campaign to legalize doctor-prescribed suicide has been rejected by most policymakers in our society. Although Oregon passed a law in 1994 allowing physicians to prescribe deadly drugs for some patients, similar proposals were rejected by legislatures and voters in all other states for many years. The claim of a constitutional right to assisted suicide was firmly rejected in 1997 by the U.S. Supreme Court, which upheld state laws against the practice as legitimate safeguards for innocent human life and the ethical integrity of medicine. But after fourteen years of defeats, the assisted suicide campaign advanced its agenda when Washington state passed a law like Oregon’s in 2008. The following year, Montana’s highest court suggested that physician-assisted suicide for terminally ill patients is not always against public policy. With expanded funding from wealthy donors, assisted suicide proponents have renewed their aggressive nationwide campaign through legislation, litigation, and public advertising, targeting states they see as most susceptible to their message. Plain speaking is needed to strip away this veneer and uncover what is at stake, for this agenda promotes neither free choice nor compassion. Scot said this segment was called “A Renewed Threat to Human Dignity”. Scot said his brother gave a talk at Harvard last week in which he said proponents have tried to advance assisted suicide in elections 127 times in the US and they’ve only succeeded 3 times. Sometimes the media makes it look this is inevitable, but we’re 124-3 in the win column. Just last week, a proposal was defeated in the Vermont Senate. Fr. Chris said legalization would affect the good moral order of the entire society, not just those directly involved. He said the Hemlock Society has co-opted good language, calling themselves compassionate. This is about taking a pill that ends your life. That’s not compassion. Scot said people who are primary caregivers will take on the role of executioners. It’s also a terrible tragedy every time someone decides to take their life. It’s always a tragedy. It’s also a corruption of the healing arts. Does the drive to legalize physician-assisted suicide really enhance choices or freedom for people with serious health conditions? No, it does not, for several reasons. First, medical professionals recognize that people who take their own lives commonly suffer from a mental illness, such as clinical depression. Suicidal desires may be triggered by very real setbacks and serious disappointments in life. However, suicidal persons become increasingly incapable of appreciating options for dealing with these problems, suffering from a kind of tunnel vision that sees relief only in death. They need help to be freed from their suicidal thoughts through counseling and support and, when necessary and helpful, medication. Because the illnesses that cause or aggravate suicidal desires are often overlooked or misdiagnosed, many civil laws provide for psychological evaluation and treatment for those who have attempted suicide. The Catholic Church, as well, recognizes that “grave psychological disturbances, anguish, or grave fear of hardship, suffering, or torture” can diminish the responsibility of people committing suicide; the Church encourages Catholics to pray for them, trusting in God’s mercy (CCC, no. 2282-3). These statements about psychological disturbance and diminished responsibility are also true of people who attempt suicide during serious illness. Yet this is often ignored in proposals authorizing assistance in these individuals’ suicides. Many such proposals permit—but do not require—an evaluation for mental illness or depression before lethal drugs are prescribed. In 3 practice such evaluations are rare, and even a finding of mental illness or depression does not necessarily prevent prescribing the drugs. No evaluation is done at the time the drugs are actually taken. In fact, such laws have generally taken great care to avoid real scrutiny of the process for doctor-prescribed death—or any inquiry into whose choice is served. In Oregon and Washington, for example, all reporting is done solely by the physician who prescribes lethal drugs. Once they are prescribed, the law requires no assessment of whether patients are acting freely, whether they are influenced by those who have financial or other motives for ensuring their death, or even whether others actually administer the drugs. Here the line between assisted suicide and homicide becomes blurred. People who request death are vulnerable. They need care and protection. To offer them lethal drugs is a victory not for freedom but for the worst form of neglect. Such abandonment is especially irresponsible when society is increasingly aware of elder abuse and other forms of mistreatment and exploitation of vulnerable persons. Second, even apparently free choices may be unduly influenced by the biases and wishes of others. Legalization proposals generally leave in place the laws against assisting most people to commit suicide, but they define a class of people whose suicides may be facilitated rather than prevented. That class typically includes people expected to live less than six months. Such predictions of a short life are notoriously unreliable. They also carry a built-in ambiguity, as some legal definitions of terminal illness include individuals who have a short time to live only if they do not receive life-supporting treatment. Thus many people with chronic illnesses or disabilities—who could live a long time if they receive basic care—may be swept up in such a definition. However wide or narrow the category may be, it defines a group of people whose death by lethal overdose is wrongly treated by the law as objectively good or acceptable, unlike the suicide of anyone else. By rescinding legal protection for the lives of one group of people, the government implicitly communicates the message—before anyone signs a form to accept this alleged benefit—that they may be better off dead. Thus the bias of too many able-bodied people against the value of life for someone with an illness or disability is embodied in official policy. This biased judgment is fueled by the excessively high premium our culture places on productivity and autonomy, which tends to discount the lives of those who have a disability or are dependent on others. If these persons say they want to die, others may be tempted to regard this not as a call for help but as the reasonable response to what they agree is a meaningless life. Those who choose to live may then be seen as selfish or irrational, as a needless burden on others, and even be encouraged to view themselves that way. In short, the assisted suicide agenda promotes a narrow and distorted notion of freedom, by creating an expectation that certain people, unlike others, will be served by being helped to choose death. Many people with illnesses and disabilities who struggle against great odds for their genuine rights—the right to adequate health care and housing, opportunities for work and mobility, and so on—are deservedly suspicious when the freedom society most eagerly offers them is the “freedom” to take their lives. Third, there is a more profound reason why the campaign for assisted suicide is a threat, not an aid, to authentic human freedom. The founders of our country declared that each human being has certain inalienable rights that government must protect. It is no accident that they named life before liberty and the pursuit of happiness. Life itself is a basic human good, the condition for enjoying all other goods on this earth. Therefore the right to life is the most basic human right. Other valued rights—the right to vote, to freedom of speech, or to equal protection under law—lose their foundation if life itself can be destroyed with impunity. As Christians we go even further: Life is our first gift from an infinitely loving Creator. It is the most fundamental element of our God-given human dignity. Moreover, by assuming and sharing our human nature, the Son of God has more fully revealed and enhanced the sacred character of each human life. Therefore one cannot uphold human freedom and dignity by devaluing human life. A choice to take one’s life is a supreme contradiction of freedom, a choice to eliminate all choices. And a society that devalues some people’s lives, by hastening and facilitating their deaths, will ultimately lose respect for their other rights and freedoms. Thus in countries that have used the idea of personal autonomy to justify voluntary assisted suicide and euthanasia, physicians have moved on to take the lives of adults who never asked to die, and newborn children who have no choice in the matter. They have developed their own concept of a “life not worth living” that has little to do with the choice of the patient. Leaders of the “aid in dying” movement in our country have also voiced support for ending the lives of people who never asked for death, whose lives they see as meaningless or as a costly burden on the community. Summarizing, the three reasons assisted suicide doesn’t really help people: People who take their own lives are often mentally ill; it devalues all human life; and apparently free choices may be influenced by the biases of others. Scot noted the New York Times recently reported that in the Netherlands there is a group that wants to do drive-in assisted suicide. Fr. Chris said the bishops are pointing out the threats that come with assisted suicide. How many of us have seen the images of a man not in his right mind on a window ledge and police and firemen risking their lives to protect the life of the man on the windowsill. We know as a society that we have to save and preserve those in similar situations. Scot asked listeners to imagine a firefighter showing up at a house fire and asking if it the life of the person left in the inferno was worth saving. That’s crazy. Firefighters and police officers train to be willing to risk their own lives to protect others. This is what is built into men as husbands and fathers. How can we look at a proposal to say we’re willing to let others die or even be coerced into death while we stand by? Fr. chris said lifers the first principle. From life flows all of our other rights. Scot said it came before liberty for a reason. Fr. Chris said there’s a hierarchy. You can’t have freedom or the pursuit of happiness without life. Scot said he learned in seminary that there is a difference between Catholic thinking and secular thinking. What makes us valuable is our being in the made and likeness of God, not what we do or how productive we are. This proposed law does make a dichotomy by saying some lives are more valuable than others. The idea that assisting a suicide shows compassion and eliminates suffering is equally misguided. It eliminates the person, and results in suffering for those left behind—grieving families and friends, and other vulnerable people who may be influenced by this event to see death as an escape. The sufferings caused by chronic or terminal illness are often severe. They cry out for our compassion, a word whose root meaning is to “suffer with” another person. True compassion alleviates suffering while maintaining solidarity with those who suffer. It does not put lethal drugs in their hands and abandon them to their suicidal impulses, or to the self-serving motives of others who may want them dead. It helps vulnerable people with their problems instead of treating them as the problem. Taking life in the name of compassion also invites a slippery slope toward ending the lives of people with non-terminal conditions. Dutch doctors, who once limited euthanasia to terminally ill patients, now provide lethal drugs to people with chronic illnesses and disabilities, mental illness, and even melancholy. Once they convinced themselves that ending a short life can be an act of compassion, it was morbidly logical to conclude that ending a longer life may show even more compassion. Psychologically, as well, the physician who has begun to offer death as a solution for some illnesses is tempted to view it as the answer for an ever-broader range of problems. This agenda actually risks adding to the suffering of seriously ill people. Their worst suffering is often not physical pain, which can be alleviated with competent medical care, but feelings of isolation and hopelessness. The realization that others—or society as a whole—may see their death as an acceptable or even desirable solution to their problems can only magnify this kind of suffering. Even health care providers’ ability and willingness to provide palliative care such as effective pain management can be undermined by authorizing assisted suicide. Studies indicate that untreated pain among terminally ill patients may increase and development of hospice care can stagnate after assisted suicide is legalized. Government programs and private insurers may even limit support for care that could extend life, while emphasizing the “cost-effective” solution of a doctor-prescribed death. The reason for such trends is easy to understand. Why would medical professionals spend a lifetime developing the empathy and skills needed for the difficult but important task of providing optimum care, once society has authorized a “solution” for suffering patients that requires no skill at all? Once some people have become candidates for the inexpensive treatment of assisted suicide, public and private payers for health coverage also find it easy to direct life-affirming resources elsewhere. Scot said the proposal of those in favor of the ballot initiative says that to eliminate suffering take a pill, but this only eliminates the sufferer, not the suffering. We say we should increase pain management and other techniques to reduce suffering. But if people are just going to commit suicide, some will ask why we need to waste time and resources on palliative care? Fr. Chris said he was struck by the discussion of cost effectiveness for health care providers. Scot said people say that no insurer ever denied coverage for someone who refuses to take the suicide pill. He said it only agrees with what we know already about human nature and track record of some bean counters and penny pushers. There is an infinitely better way to address the needs of people with serious illnesses. Our society should embrace what Pope John Paul II called “the way of love and true mercy”—a readiness to surround patients with love, support, and companionship, providing the assistance needed to ease their physical, emotional, and spiritual suffering. This approach must be anchored in unconditional respect for their human dignity, beginning with respect for the inherent value of their lives. Respect for life does not demand that we attempt to prolong life by using medical treatments that are ineffective or unduly burdensome. Nor does it mean we should deprive suffering patients of needed pain medications out of a misplaced or exaggerated fear that they might have the side effect of shortening life. The risk of such an effect is extremely low when pain medication is adjusted to a patient’s level of pain, with the laudable purpose of simply addressing that pain (CCC, no. 2279). In fact, severe pain can shorten life, while effective palliative care can enhance the length as well as the quality of a person’s life. It can even alleviate the fears and problems that lead some patients to the desperation of considering suicide. Effective palliative care also allows patients to devote their attention to the unfinished business of their lives, to arrive at a sense of peace with God, with loved ones, and with themselves. No one should dismiss this time as useless or meaningless. Learning how to face this last stage of our earthly lives is one of the most important and meaningful things each of us will do, and caregivers who help people through this process are also doing enormously important work. As Christians we believe that even suffering itself need not be meaningless—for as Pope John Paul II showed during his final illness, suffering accepted in love can bring us closer to the mystery of Christ’s sacrifice for the salvation of others. Catholics should be leaders in the effort to defend and uphold the principle that each of us has a right to live with dignity through every day of our lives. As disciples of one who is Lord of the living, we need to be messengers of the Gospel of Life. We should join with other concerned Americans, including disability rights advocates, charitable organizations, and members of the healing professions, to stand for the dignity of people with serious illnesses and disabilities and promote life-affirming solutions for their problems and hardships. We should ensure that the families of people with chronic or terminal illness will advocate for the rights of their loved ones, and will never feel they have been left alone in caring for their needs. The claim that the “quick fix” of an overdose of drugs can substitute for these efforts is an affront to patients, caregivers and the ideals of medicine. When we grow old or sick and we are tempted to lose heart, we should be surrounded by people who ask “How can we help?” We deserve to grow old in a society that views our cares and needs with a compassion grounded in respect, offering genuine support in our final days. The choices we make together now will decide whether this is the kind of caring society we will leave to future generations. We can help build a world in which love is stronger than death. Scot asked what kind of society we want to live in. That’s really what this comes down to and we have a chance to do with regard to this proposed ballot initiative. Fr. Chris said the quick fix of assisted suicide is an affront to the Gospel, where we are all called to love and mercy, especially when we hear about the corporal works of mercy. Scot said it’s important for us to choose a better way to deal with the hopes and fears of the end of life. We have to be able to trust health care providers will work to help us and save our lives, not to work to take them away. Fr. Chris said listeners have to get the word out that true compassion is being closed to our loved ones.